The Corps of Engineers' Walla Walla Division hosted its annual research review Dec. 3-5, where regional scientists reported their latest results on barging fish, dealing with birds and developing performance standards for survival at lower Snake dams. They also reported on development of an injectable acoustic tag to aid in tracking ever smaller juvenile salmon. NOAA Fisheries scientists from the agency's Seattle science center announced their latest findings on fish transportation and smolt-to-adult returns. They said, before 2006, the estimated ratio of SARs [smolt-to-adult return rates] between barged and most inriver migrating fish nearly always exceeded "standards" (higher than 1.0) for fish that arrived at Lower Granite Dam by May 1 or later. But since then, barging survival began to beat inriver passage later in May, especially for steelhead. They noted that years of data need to be collected to determine the degree to which the modified transportation strategy (starting later) has changed SAR and T:B patterns. The latest results for migration year 2011 showed that juvenile wild spring Chinook tagged above Lower Granite didn't really benefit from the barging strategy until after May 15, compared to bypassed smolts that were returned to the river, but smolts tagged at the dam showed better SARs throughout the migration season. However hatchery spring Chinook did not seem to benefit from barging in 2011. Both wild and hatchery steelhead showed a benefit from barging through the entire season, with SARs about 50 percent better than inriver migrants. NOAA estimated only 28 percent of the wild spring Chinook were undetected (passing via spillways or turbines) in 2011, so measuring barged survival compared to undetecteds would not provide an answer that looked at barging compared to most of the run-at-large. The NOAA scientists had not yet computed benefits for the 2010 and 2011 wild spring Chinook, but for 2009, SARs of transported fish were generally 100 percent better than SARs of fish returned to the river. In 2008, they were 50 percent to 100 percent higher than SARs of fish returned to the river. For wild steelhead, SARs of barged fish were 50 percent to 100 percent higher in 2010, and averaged 50 percent higher in 2011. Using a newer analysis, the NOAA group looked at data from barging fall Chinook from the Snake and found that bypassed fish returned at higher rates than transported fish until mid-June, when transported fish did better. By pooling annual data, averaging across years and different types of subyearlings, the transported return was higher than bypassed returns at all dams--14 percent higher at Lower Granite, 15 percent at Little Goose, 20 percent at Lower Monumental and 201 percent at McNary. Another NOAA presentation reported that only about 34 percent of Snake spring Chinook and 38 percent of the steelhead were barged from Snake dams in 2013, higher than last year's record lows (less than 30 percent) and close to the average over the past six years. Barging began on April 27 and "roughly" half the smolts that arrived at Lower Granite were transported from one of the collector dams. The NOAA group estimated juvenile spring Chinook survival at 62.1 percent through the hydro system, the third highest observed; for steelhead, it was 50.1 percent, about 12 percent lower than the average over the past four years. But they also noted that survival from the Snake River smolt trap (near Lewiston) to Lower Granite Dam was about 84.5 percent, the lowest since 1993. They said low flows were characteristic of spring migration conditions in 2013, with moderately high temperatures at times, and above-average spill percentages. A presentation by NOAA's Jennifer Gosselin looked at survival differences between barged and inriver smolts before they reached the ocean. Gosselin captured smolts and determined how long they survived after each mode of passage. She found a significant difference between run-of-river fish and barged fish before they entered the ocean--earlier migrating inriver fish had higher SARs than barged fish--but later in the season, barged fish had better SARs back to Bonneville Dam. Her analysis suggested that inriver fish lose their survival advantage by being subjected to higher water temperatures than the barged fish, and barging becomes "increasingly beneficial as the season progresses." A presentation by the University of Washington's Jim Anderson examined delayed mortality from another angle, whether differences in fish survival are due to inriver conditions like travel time, spill and route of passage or to fish condition. Anderson developed a survival model that suggests smolt size and general ocean conditions (the Pacific Decadal Oscillation) play important roles in the ultimate survival and return as an adult. According to Anderson's presentation, smolt size is most important when the fish enter the ocean, since the larger ones may be subject to less predation by bigger fish like hake. But ocean productivity plays an important factor once the juveniles head north. If there is enough to eat, young fish can grow large enough to survive their first winter in the Gulf of Alaska. Bird researchers from Oregon State University provided the latest update on avian predation and the news was mixed. After experimenting with several techniques to reduce the size of the double-crested cormorant colony in the Columbia estuary, they reported that the colony was about 15 percent larger than the previous two years. It now contains 14,900 breeding pairs, about 40 percent of the breeding population of this species in western North America, "the largest known breeding colony of the species anywhere." The good news is that the cormorants' diet was estimated to be made up of only 10 percent salmonids this year, compared to 20 percent in 2012. The cormorants ate nearly 19 million salmonid smolts in 2012. 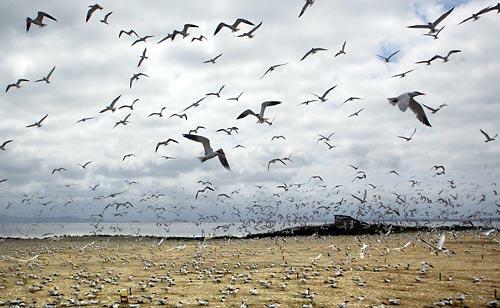 Others reported on the unsettling fact that predation by gulls may be significantly underreported, since an independent study found that 38 percent of the PIT tags ingested by gulls were rendered unreadable following digestion. When predation factors were adjusted, some gull colonies, like the one at Miller Rocks in The Dalles Reservoir and Crescent Island in McNary Reservoir, were estimated to have up to an 8.5-percent predation rate. Others were much less. Caspian terns, which were originally the Corps' main target species for reducing predation on salmonids, are still consuming up to 10 percent of the steelhead coming from above Bonneville Dam, but have much less impact (.7 percent to 2.2 percent) on other salmon ESUs, according to another group of bird researchers. The double-crested cormorants were estimated to have consumed more than 7 percent of the upper Columbia steelhead, with lesser impacts on other populations. In a special experiment that tagged lower Columbia fall Chinook, the terns consumed 2.6 percent, while the cormorants ate a minimum of 14.9 percent. The researchers said only three national fish hatcheries above Bonneville (Carson, Little White Salmon, Spring Creek) produce about 66 percent of all tagged fish released in the river. "Based on the skewed tag distribution," the researchers' abstract said, "we estimated overall minimum predation rates to be .9 percent for Caspian terns, 2.9 percent for double-crested cormorants, and .2 percent for Brandt's cormorants." Other provocative results found that some sockeye radio-tagged in 2013 seemed to go missing between Bonneville and McNary dams. University of Idaho researchers estimated the conversion rate between the two dams was close to 86 percent. "To date," said their abstract, "11 percent of the sockeye salmon that passed Bonneville Dam but not McNary Dam have been reported harvested. Telemetry records suggest that additional sockeye were harvested but not reported and a few had final detections in Bonneville Reservoir tributaries (i.e., possible strays or unreported harvest)." Another study conducted by the Columbia River Inter-Tribal Fish Commission looked at 2012 PIT-tagged sockeye and estimated that 32.6 percent were harvested, while 25.6 percent made it to terminal areas, with the remaining 41.8 percent unaccounted for. "Highest rates of unaccounted sockeye were in terminal areas above Wells and Tumwater dams as well as between Bonneville and McNary dams." Meanwhile, other researchers from PNNL and the UW reported that survival of juvenile fall Chinook at Little Goose Dam was slightly above 90 percent, and nearly 93 percent at Lower Monumental Dam after tagging 11,000 smolts with acoustic tags in the second year of compliance testing for BiOp performance standards. The 2008 BiOp calls for a 93-percent survival standard at each dam. 2013 Anadromous Fish Evaluation Program Annual Review available at Dropbox.